Today we are introducing our next film in the We Are CCEP series. 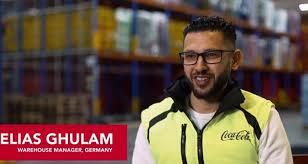 During our fourth stop on our filming tour, we met Elias – Warehouse Manager at our factory in Fürstenfeldbruck, Germany. Elias and his team are responsible for getting our products from the factory to our customer outlets on time. They load up to 80-100 trucks per day, constantly reviewing our processes and performance to ensure we are working with speed and agility. What does your role involve? My role involves managing 111 employees, who are assigned to picking products from our warehouse, forklift driving and loading trucks and the general logistical administration and planning for this site. Why did you want to work for Coca-Cola European Partners? I have wanted to work at Coca-Cola since the age of twelve - I am fascinated by the brand. What made you choose this career path? For me personally, I understand the importance of parcels arriving on time and therefore I want our customers to receive their orders and products punctually. A career in logistics is where I can exercise most influence in achieving this. What advice would you give to young people wanting to follow a similar career path? I would advise young people to be confident and believe in themselves and their skills. Then they will make it. They should always listen to the feedback and opinions of others. Be prepared for some setbacks – sometimes you have to move one step back to move two steps forward – but don’t be discouraged from pursuing their goal. Why is it important to work with speed and agility in your role? In logistics you must be prepared for many factors. No day is the same and there are always new challenges. That’s why we must be quick and agile to respond to these challenges and the needs of our customers. What is the best part of your job? The best part of my day is at 7am when I receive an email confirming that there were no issues on site and that our customers received their deliveries on time. This is important for me, because I want happy employees and happy customers. What do you like doing outside work? Outside work I’m studying a course on Logistics & Supply Chain Management to help with my progression and reach my goals. I love spending time with my family – particularly with my two children. My family is the basis for my success.